Selecting a laser source for your application can be overwhelming. There are many types of lasers and levels of integration to choose from, so it is essential to know their differences and the impacts they can have on your project. In the paragraphs below, we provide an overview of laser types and information about their parameters to help answer any questions you may have. What is a Solid State Laser? A resonator is every part of the laser that is in between the reflectors. The resonator controls the wavelength and output power of the laser. 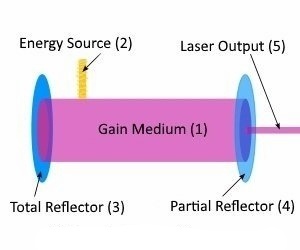 The gain medium, also known as the active laser medium, is an integral part of the resonator and is used to classify the laser type. The operation of any laser should be done in a controlled environment, adhering to all safety regulations. A solid-state laser is a laser that uses a gain medium that is a solid, rather than a liquid as used in dye lasers or the gas that's in a gas laser. 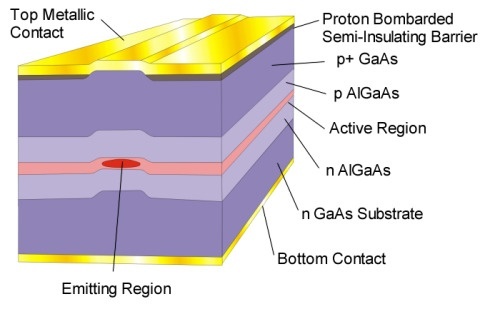 The gain medium of a solid-state laser consists of a glass or crystalline "host" material. There are many host materials in which laser excitation has been achieved, but relatively few types are in widespread use. Of these, the most common ones are neodymium-doped yttrium aluminum garnet (Nd: YAG), Neodymium-doped glass (Nd: glass), and ytterbium-doped glasses. The gain medium is typically optically pumped, using either a flashlamp or by laser diodes. 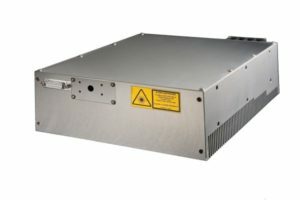 Diode-pumped solid-state (DPSS) lasers tend to be more efficient, with lower overall maintenance and have become more common as the cost of high-power laser diodes has gone down. Semiconductor Lasers are also solid-state lasers but are considered as a separate class of solid-state lasers and often call Laser Diodes or Diode Lasers. Laser Diodes use electrical power as an energy source and doped p-n junctions as a gain medium. The front facet is a partial reflector, and the back facet is the total reflector. Therefore the front facet is the output facet of the laser emission. This Guide will focus on Solid-State Lasers; Diode Pumped (DPSS) and Lamp Pumped Lasers, and Semiconductor Laser Diodes. We have split up the laser sources into 3 product categories; Laser Diodes, Pulsed Lasers, Continuous Wave (CW) Lasers. Each laser category, and sometimes the laser type within the categories, will have distinct advantages and disadvantages based on the specifications needed for your application. See our blogs about lasers used in Lidar, Gas Sensing, Micromachining, and holography. A laser diode or semiconductor laser is the simplest form of Solid State Laser. Laser diodes are commonly referred to as edge emitting laser diodes because the laser light is emitted from the edge of the substrate. The light emitting region of the laser diode is commonly called the emitter. The emitter size and the number of emitters determine output power and beam quality of a laser diode. Single mode laser diodes typically have an emitter that is approximately 3µm - 7µm x 1µm, dependent on the wavelength. The emitter allows only a single mode to propagate along the active region. Multimode laser diodes have the emitter width enlarged to allow multiple modes in the active region. The emitters can be 30µm - 300µm x ~1µm. These Fabry Perot Diode Lasers with a single emission region (Emitter) are typically called laser diode chips, while a linear array of emitters is called laser diode bars. 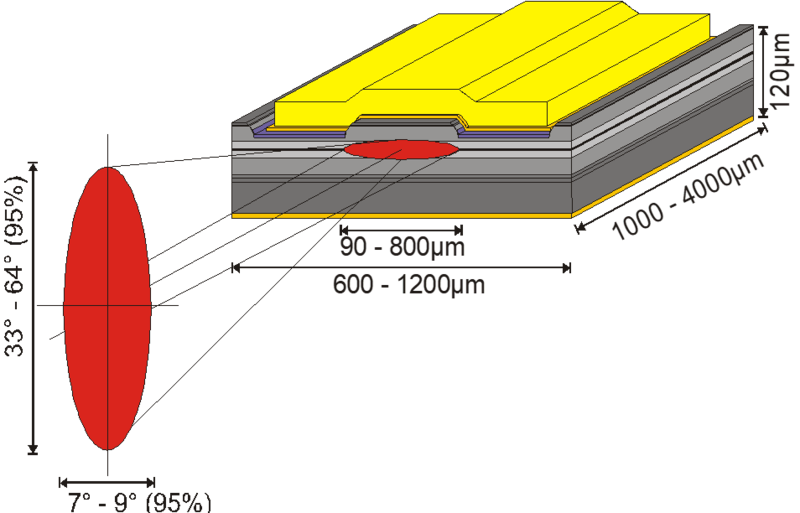 Laser diode bars typically use multimode emitters, the number of emitters per substrate can vary from 5 emitters to 100 emitters. VCSELs (Vertical Cavity Surface Emitting Laser) emit light perpendicular to the mounting surface as opposed to parallel like edge emitting laser diodes. See our blog on VCSELs for more information. Single emitters have a single emitting region (Emitter) that emits light. They can be multimode or single mode depending on the emitter size. Single Mode Laser Diodes are single transverse mode, they may or may not be single longitudinal mode. They are used for applications where high output power is not required, but a good, diffraction-limited beam is essential. An output power of up to ~1W depending on the wavelength. Available in free space and fiber coupled packages. Stabilized Single Mode Laser Diodes diodes use an external feature to ensure single longitudinal mode. Stabilized laser diodes include DFB, DBR, and external cavity laser diodes. Output powers typically range from 1mW – 600mW depending on the wavelength. Available in free space and fiber coupled packages. Multimode Laser Diodes also known as Broad Area Diode Lasers, offer higher output power than single mode laser diodes. For applications where higher power is required, and beam quality is not as critical. Multimode laser diodes are spatially and longitudinally multimode. Output powers are in the order of 100mW - 10W per emitter depending on the wavelength. Available in free space and fiber coupled packages. Stabilized Multimode Laser Diodes use an external feature to ensure single longitudinal mode. Stabilized multimode laser diodes are typically external cavity laser diodes. Output powers typically range from 50mW – 8W depending on the wavelength. Available in free space and fiber coupled packages. Multi-emitters include devices that utilized multiple single emitters in the package, usually multimode laser diodes and typically fiber coupled output. By combining the output of multiple single emitter devices, the output power can be increased. An advantage of the multi-emitter approach is they require lower current than a laser diode bar based approach. An Array or Laser Diode Bar has multiple emitters in a single substrate. Laser diodes bars can have as many as 100 emitters and are typically 1 cm long. This linear array of emitters lay side by side and, together with the non-emitting areas between the emitters, they form the so-called bar. The number, the width, and the spacing of the emitters are dependent on the manufacturer and the optical performance required from the bar. The relative value of the emitting areas in the active layer with respect to the bar width is called filling factor (FF). Typical filling factors are 30% - 90%. The center-to-center distance between two adjacent emitters is called emitter pitch. Output powers are available in the order of 10W - >300W per bar. Laser diodes bars are available as unmounted laser diode bars or mounted in conductively or actively cooled packages. Stacks use laser diode bars built up, either vertically or horizontally, in the single package. Microchannel cooling is often used in laser diode bar stacks due to a large amount of waste heat in a small area. Laser Diode Bars and Stacks are available in several free space and fiber coupled packages. 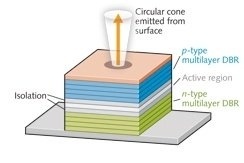 VCSELs (Vertical Cavity Surface Emitting Laser) emit light perpendicular to the mounting surface as opposed to the parallel to the mounting surface like conventional edge emitting laser diodes. VCSELs offer a uniform spatial illumination in a circular illumination pattern with low speckle. Turn-key Systems include the laser diode, the optics, thermal management, and the electronics required as a complete system and requires minimal setup time. 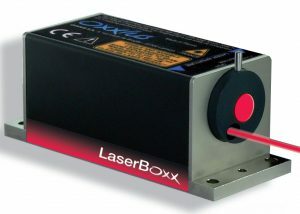 CW Lasers and Laser Diode Modules emit continuous light, unlike the pulsed lasers (See below). Some wavelengths are achieved using laser diodes, and other wavelengths are achieved using a Diode Pumped Solid State Laser. The beam parameters vary depending on the laser source of the module, but in general, the CW Modules have good beam quality and stability. CW Lasers and Laser Diode Modules includes CW DPSS Lasers, CW Fiber Lasers, CW Laser Diode Modules. Laser Diode Modules use a laser diode as the laser source. DPSS Laser modules use laser diodes as the pump source for a laser gain medium. Multi Wavelength Combiner Modules merge multiple laser sources into a single unit with individual and independent control for each laser in an easy to use interface. Pulsed lasers have a gain medium that is typically optically pumped using either a flashlamp or by laser diodes (DPSS). 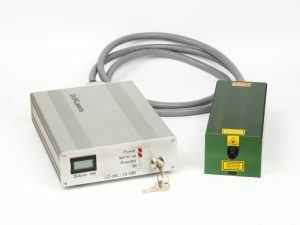 Pulsed Lasers utilize a Q-Switch to store energy and release then it in pulses, unlike CW lasers and Laser Diodes which emits energy continuously. Pulsed Lasers are available in wide range of pulse widths from femtosecond through millisecond. The repetition rates range from single shot to Mhz. Active Q-Switched Lasers allow the precise control of both the pulse width and repetition rate of the laser. Passive Q-Switched Lasers contain a Saturable Absorber that when continuously pumped produces a regular pulse train. Passive Q-Switch lasers cannot precisely control the pulse externally. Includes Diode Pumped Solid State (DPSS) Lasers, Flashlamp Lasers, Fiber Lasers, and Microlasers/Microchip Lasers. Fiber Lasers use an optical fiber as the gain medium, a variation on the standard solid-state laser that uses a rod, a slab, or a disk. The first step in finding the right laser your application is to define the laser type. Whether it's a laser diode, a CW laser module, or a pulsed laser, the type of laser you select will determine what main characteristics are important to your application. For example, if you select a CW laser module, the pulse width and repetition rate are not characteristics for CW Lasers. Once the laser type is chosen, the next step is to define the main laser specifications needed in your laser. These typically include the wavelength, the beam, any optical parameters, the integration level, also the pulse width and rep rate if applicable. The importance of each of these characteristics will depend on your application. For some applications, the exact wavelength may not be critical, but excellent beam quality or specific pulse width is critical. On other applications, the wavelength must be tightly controlled with a narrow spectrum. Knowing the specifications for your application is critical for selecting the right laser source. The output wavelength of a laser depends on the laser material, the process of stimulated emission, and the optics of the laser resonator. For each transition between energy levels, a given material can support stimulated emission over a limited range of wavelengths. The probability of stimulated emission varies with wavelengths. The process concentrates emissions at higher probability wavelengths. Solid State Lasers and Laser Diodes are available in wavelengths from the deep UV, through Visible and IR, and into the mid-IR. Not all laser types are available in all wavelengths. In many cases, the laser type defines which wavelengths are available. From the fundamental wavelengths, additional wavelengths can be achieved by frequency doubling or second harmonic generation. For example, the most common Nd: YAG emission wavelength is 1064 nm. From 1064nm, outputs at 532, 355 and 266 nm can be generated by frequency doubling, frequency tripling, and frequency quadrupling, respectively. Other emission lines for Nd: YAG includes 946nm, 1123nm, 1319nm, 1338nm, 1415nm and 1444 nm. With the proper optimization, weaker transition lines one can obtain substantial output power. Directionality: An ordinary source of light emits light waves in all the directions and is highly divergent. However, the divergence or angular spread of a laser is very small. Monochromaticity: It means that all the laser rays have the same wavelength and frequency when they are emitted from the same source. Brightness: A laser beam has brightness many times greater than that of conventional light sources due to the high directional property of laser beam. Coherence: Two or more light waves are said to be coherent if they bear a constant phase relation among themselves. Single mode laser diodes typically have an emitter that is typically 3µm - 7µm x ~1um, dependent on the wavelength. The emitter allows only a single mode to propagate along the active region. Single mode laser diodes offer lower power, but much higher brightness than multimode laser diodes. Multimode laser diodes have the emitter width enlarged to allow multiple modes in the active region. The emitters can be 30µm - 300µm x ~1um. Multimode laser diodes offer higher output power, but the beam characteristics are not as good. Free Space Laser Diodes emit laser light in an ovular cone of light that is not collimated. The ellipticity occurs because the divergence is different in the horizontal and vertical directions. Typical values are ~40° and ~8° for the two angles of the elliptical cone. The higher divergence angle is called the fast axis divergence, the lower divergence is called the slow axis divergence. Collimating optics are required to get a collimated output from a laser diode. Collimating the light from a laser diode can be challenging. Fast axis collimating (FAC) lenses and/or Slow axis collimating (SAC) lenses are available on some devices. The light exiting the fiber has a circular and uniform intensity profile. It allows the laser diodes and heatsink to be located remotely from where the laser light is used. Defective fiber-coupled diode lasers can easily be replaced without changing the alignment of the device where the light is used. Fiber-coupled devices can be easily combined with other fiber-optic components. The output from the fiber is circular but still divergent. The divergence of the output is dependent on the Numerical Aperture (NA) of the fiber. For more information see our blog on fiber-coupled diodes. Both Single mode and Multimode laser diodes can be fiber coupled. Single mode laser diodes can be coupled into single-mode fibers, multimode fibers, or polarization maintaining fibers. Multimode laser diodes can only be coupled into a Multimode fiber. Multimode fiber has a larger core diameter and allows multiple modes of light to propagate the fiber. The core diameter can be from 50um to over 800um. The NA for many multimode fibers is either 0.15 NA or 0.22 NA. Single-mode fiber allows only a single mode of light to propagate the length of the fiber. Single mode fiber typically has a 9um core. The typical NA for single-mode fiber is ~0.12-0.15 NA. Polarization maintaining fiber is single-mode fiber that also maintains the linear polarization of the light as it propagates through the fiber. Such fiber is used in applications where preserving polarization is essential. Fiber Delivery can simplify and add flexibility to your design. Collimating the beam after the fiber is much easier than collimating a free space laser diode. Coherence Length – The narrower the range of wavelengths, the more coherent the beam—meaning the more precisely every light wave in the beam is in exact synchronization with every other one. This is measured by a quantity called coherence length. To increase the coherence in a laser diode, typically a grating is required. This grating can be internal or external to the laser diode itself. CW Laser Diode Modules have corrective optics built in and typically single mode modules deliver a circular, collimated output beam. The divergence angle depends on the collimating optics used. 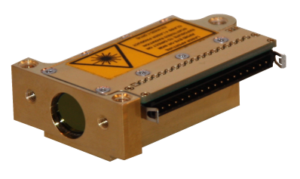 CW DPSS Laser Modules are highly directional with very low divergence. Only waves propagating along the optical axis can be sustained in the cavity, where the laser comes from, which causes the lower divergence. DPSS Laser Modules also have high monochromaticity, brightness, and coherence; all the emitted photons have the same energy, frequency, or wavelength. Hence, the light waves of a laser have single wavelength or color and highly coherent. Because of this coherence, a large amount of power can be concentrated in a small area. CW Modules typically have either a Plug and Play (turn-key) version or an OEM version. Plug and Play versions typically include a fully CDRH compliant control box that includes the power supply and the safety features required for CDRH compliance. OEM versions typically include the laser without the power supply, heatsink, or the control box with CDRH required safety features. OEM modules are intended to be installed into a larger system that supplies the power, thermal management, and CDRH safety features. Mode – The mode is primarily used to define the type of laser diodes used in the laser diode modules. Single-mode versus multimode. Multimode modules utilize a multimode laser diode which offers higher output power, but the beam (typically elliptical) characteristics are not as good. Multimode Green DPSS Lasers are also available. It allows the laser module and heatsink to be located remotely from where the laser light is used. A defective fiber-coupled module can easily be replaced without changing the alignment of the device where the light is used. The output from the fiber is circular but still divergent. The divergence of the output is dependent on the Numerical Aperture (NA) of the fiber. Single-mode fiber allows only a single mode of light to propagate the length of the fiber. Single-mode fiber typically has a 9um core. The typically NA for single mode fiber is ~0.12-0.15 NA. Polarization maintaining fiber is single mode fiber that also maintains the linear polarization of the light as it propagates through the fiber. Such fiber is used in applications where preserving polarization is essential. Coherence Length – The narrower the range of wavelengths, the more coherent the beam—meaning the more precisely every light wave in the beam is in exact synchronization with every other one. This is measured by a quantity called coherence length. 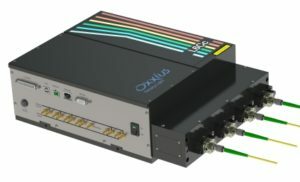 Many of the CW DPSS Laser Modules can be single longitudinal mode (SLM). SLM DPSS Lasers typically have a coherence length >50m. To increase the coherence in a laser diode module, typically a grating is required. Volume Bragg Grating laser diodes use an external grating to lock the wavelength. These are usually called stabilized laser diode modules. Stabilized Laser Diode Modules typically have a coherence length of >1m. Pulsed DPSS Lasers are highly directional with very small divergence. Only waves propagating along the optical axis can be sustained in the cavity, where the laser comes from, which causes the lower divergence DPSS Laser Modules also have high monochromaticity, brightness, and coherence, all the emitted photons have the same energy, frequency, or wavelength. Hence, the light waves of a laser have single wavelength or color and highly coherent. Because of this coherence, a large amount of power can be concentrated in a small area. Millisecond Lasers - Millisecond Lasers emit pulses in the millisecond duration and are considered a long-pulse laser. These lasers are used for hair removal. Nanosecond Lasers - Nanosecond lasers emit optical pulses in the nanosecond duration. A nanosecond (ns) is a unit of time equal to one thousand-millionth of a second, one billionth of a second, or 10−9 seconds. 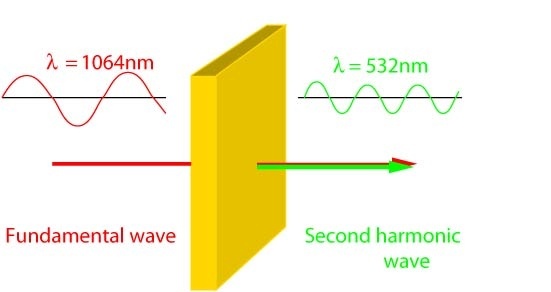 Optical pulses with a pulse duration in the nanosecond range are required for many applications, including material processing, distance measurements, and remote sensing. Picosecond Lasers - Picosecond lasers are lasers that emit pulses in the picosecond duration. A picosecond (ps) is a million millionth of a second, or 10 -12 second. To be considered an ultrafast laser, the pulse duration of the laser needs to be 10ps or less. At a given pulse energy, the peak power of the laser increases as the pulse width gets shorter. Therefore, a picosecond laser will have a much higher peak power than a longer nanosecond or millisecond pulsed laser. These higher peak powers result in higher removal rates in a given material because more energy is transferred through the material and less is put into the heating of the material. The high peak powers of picosecond lasers, often several MW, creates a breakdown between the electrons and atoms in the material, creating what is known as a Coulomb explosion. A Coulomb explosion is a cold processing alternative to the conventional thermal ablation utilized by longer pulsed lasers. In contrast, Ablation is a thermal process that relies on local heating, melting, and vaporization of molecules and atoms…. which can be detrimental to some laser applications. Femtosecond Lasers - A femtosecond laser is a laser which emits optical pulses with a duration below 1 picosecond. A femtosecond (fs) is 10−15 second. Lasers that produce less than 10 picoseconds pulses belong to the category of ultrafast lasers or ultrashort pulse lasers. Ultrafast Lasers are ideal for the cold ablation of any material, including metals, ceramics, polymers, composites, coatings, glass, plastics, diamonds, and PET. Ultrafast lasers can even operate on layered substrates. Cold ablation allows for material to be removed without heating the residual matter. Thus, femtosecond fiber lasers will not produce heat affected zones, splatter, or significant recast. Additionally, these lasers will eliminate the need for any post-processing. The pulse width and rep rate are used to define the average power of the laser. The output from a pulsed laser can be either free space or fiber coupled. The primary difference is the free space output from a pulsed laser typically has a collimated beam as because laser beam comes from the resonant cavity, and only waves propagating along the optical axis can be sustained in the cavity. Unmounted Chips or Bars are the most basic. A laser diode chip or bar is a laser die with the facet coatings. Great care and experience are required to handle the laser diode at this level. The chip or bar can be sold as a package or submount to provide the required thermal and electrical connections. Conductive Cooled devices will require mounting to a heatsink that will conductivity remove the heat from the laser diode. Depending on the amount of waste heat, the heatsink may be very small and simple, or much more elaborate with water cooling. Turn-key systems include all the equipment necessary to operate the laser diode and are fully CDRH compliant. The includes the laser diode package, the thermal management, the optical components, and the electrical system for control. OEM versions typically include the laser without the power supply, heatsink, or the control box with CDRH required safety features. OEM modules are intended to be installed into a more extensive system that supplies the power, thermal management, and CDRH safety features. 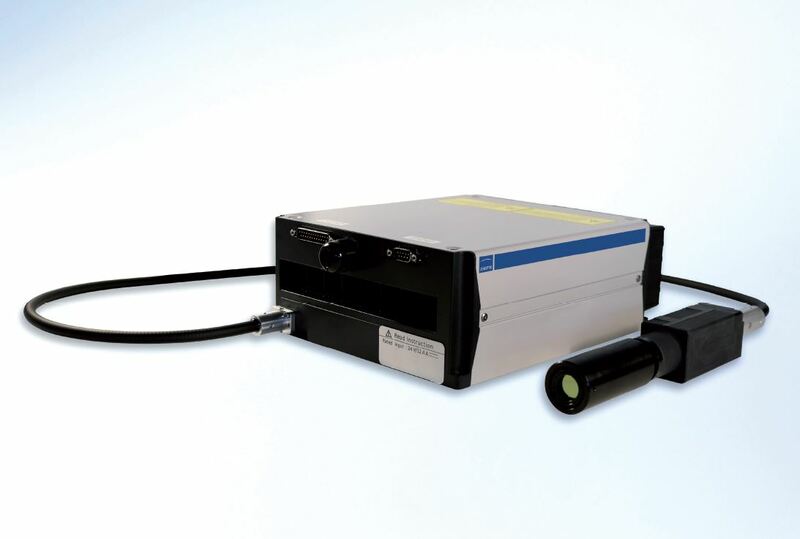 Pulsed DPSS Lasers are designed as an OEM component to be used in a system. The system integrator supplies the power, thermal management, beam or sample positioning equipment, and CDRH safety features required for the product. We are still working on improving this page. We know this guide is not complete, we will continue to update with additional information as time permits. If you have any suggestions or ideas on what else we should include, please let us know. We hope this guide will be a valuable tool for you in the future.